The Doncaster area seemed to have had more than its fair share of independents and here is another one Blue Ensign. There first route was from Rossington to Doncaster Yorkshire in 1920. I think the reason for the number of independents was all the mining towns in the area and as Blue Ensign they start by running one route to Doncaster. Blue Ensign I think was more as the name suggests a coach operator rather than bus as they only purchased 3 more buses after the one above before selling out to South Yorkshire PTE on the 1st April 1978. This vehicle still exists although it is now open top at the Sinsheim Transport Museum, Germany. Blue Ensign ran from a depot in the centre of Doncaster and had a fleet of six vehicles – 3 coaches and three double deckers, latterly 3 Fleetlines. My Grandmother "Molly" was a Clippy for Blue Ensign for many years. Grand mother is the only existing member of the crew now. Many days of our childhood were spent sat onboard the bus and meeting the regular passengers that used it. I recall that the busses were all kept immaculate, and the staff were very proud to be part of Blue Ensign. Grandma also arranged several trips and holidays around Britain with their coaches, particularly Teignmouth Devon stopping at a London Hotel, Lake Windermere, Scotland, Blackpool lights, and Woburn Abbey. These are wonderful memory’s. Until the 1960s Doncaster was an absolute Mecca for enthusiasts of quality vehicles and operators of character and pride. Many’s the Saturday a group of us from the Leeds area would travel south, and spend a happy afternoon at the Christ Church terminus revelling in the variety to be seen and heard. We also used to take refreshments in the cafe there where, from the chatter of the many crews, we could really absorb the atmosphere of this once fascinating locality. Yesterday sadly my Grandmother Molly passed away. Grandma spent many many years has a clippy for the Blue Ensign I am very proud of my Grandma to be part of the Blue Ensign Rossington bus service. She will be sadly missed by myself and her family. I’m sorry to read about your Grandma Gary – all the elements of the grand, proud old bus operators are dwindling fast nowadays sadly. I spent my happiest years working for Samuel Ledgard of Leeds – larger of course than the Doncaster area firms and with five depots and 100 + vehicles but the same proud spirit of service nevertheless. The Firm sold out on 14th October 1967 and so there are very few of us left now of course, but along with your Grandmother and the rest we proudly provided a reliable service which is sadly missed today. Sorry to hear this- my condolences. I remember these buses in that immaculate livery: not easy to maintain on those (then) filthy roads with their covering of slurry from the coal wagons. I lived in Doncaster towards the end of this magnificently kept vehicles stay with Blue Ensign. We used to travel to school on her every day – and yes, I remember Molly. They (759 NDT, 3568 DT & PDT 497E) were always immaculate – no matter what the weather. I was really sad to see the Regents go – the Daimler replacements were never the same – and then the PTE marched in and bought the company. I rode on the last bus Blue Ensign ran as an independent – a really sad night. Too true Peter – the "last nights" of these wonderful proud independent operators are too sad for words. There is always a strange feeling, earlier in the day, that the end has already come and that the final journeys are not "real." Pre M1/M18 the Oldfield clan regularly made pilgrimages to the East Coast – normally Scarborough – via Rotherham and Doncaster. It was at such time that I came into most regular contact with the famous Doncaster Independents. 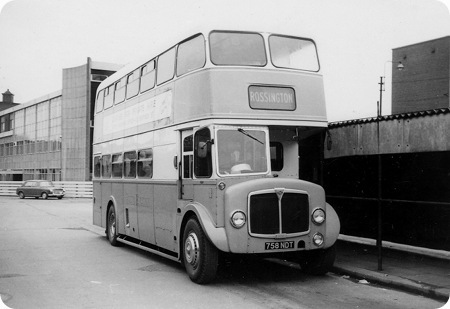 The blessed C H Roe was the most common sight, but variously on AEC, Daimler, Guy or Leyland chassis. My favourites were the AECs but, as Peter said, anything not half cab was a step down in both quality and character. Fleetlines (and Atlanteans) were the first step on the slippery slope to modern "efficient, characterless sewing-machines" (my quote). The only thing worse was the total destruction, for purely political reasons, of viable operators, up and down the land, of the like of the Doncaster Independents. Progress and change are not always bad, quite the opposite, but it seems always to be the case where the bus industry is concerned. lets fly the Ensign! Passing through Doncaster at the weekend, I stopped off for an hour and had a wander round to Cleveland Street and I can report that the old Blue Ensign depot still stands to this day although it’s in a sorry state now, fenced off and semi-derelict. There is a small square building at the front of the yard which I believe was their administration block and booking office for excursions and private hire. Thirty Four years after being taken over, a reminder still exists of a much loved independent whose fleet was always immaculately presented and a credit to the industry! There’s a colour picture of 3568 DT at http://www.sct61.org.uk/zz3568dta looking absolutely GLORIOUS! Though I grew up in a red and cream area, for some reason I’ve always been partial to blue buses (Alexander Midland, Bradford, 70’s Brighton), but this one tops the lot. By the way, does anyone know whether the upper and lower window surrounds were actually two different colours ("white" and "cream"), or is it just a trick of the light in this picture? It is a trick of the light, it was the same shade of cream at both upper and lower deck windows.